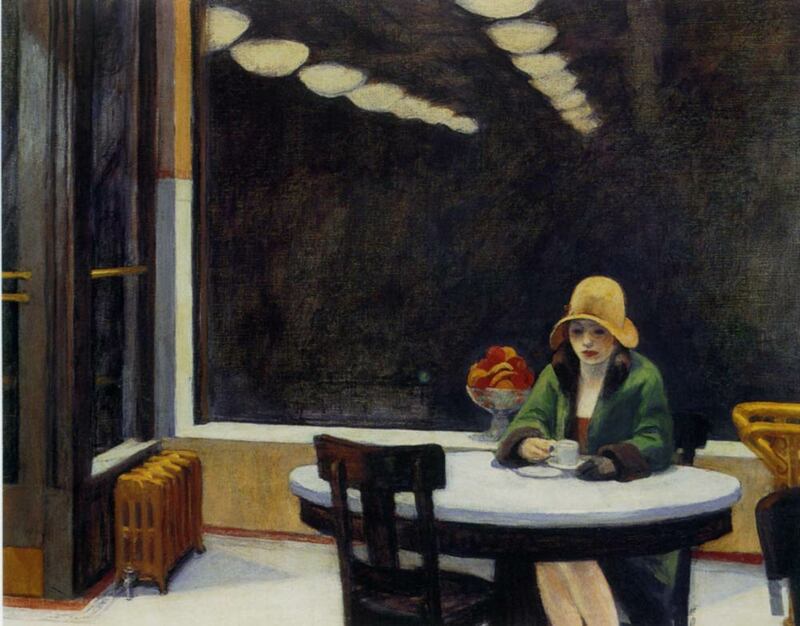 Edward Hopper, the famous realist painter, painted Automat in 1927. The oil on canvas painting depicts a woman alone drinking a cup of coffee in an automat. The imagery and symbolism within this painting is meant to speak of the turbulent times in which it was painted. The most obvious image in the Automat is the lone woman sitting in an automated diner. Through the window behind her, the viewer sees the pure dark night. The creative use of the oil paint gives a reflective light that helps add to the feeling of loneliness. The painting was created in the Roaring Twenties, yet it appears that she is not a part of it. The pushed in chair, her fancy green coat with fur around the collar and the mix match hat pulled down over her face suggest that this woman is carrying a huge burden. As with other Hopper paintings, there are no visible doors. The woman appears trapped in her own despair. Hopper’s Automat uses light and shadows to drive the viewer’s eye to the many symbols in his work. The dark corner and the shadows underneath the table bring to the forefront the feeling of sadness the woman evokes. In addition, the woman’s whitewashed skin and emotionless face seem to draw in the viewer. His use of geometry creates strong imagery without being flashy. The vibrant colors and stiff shapes, such as the huge black rectangular window showing only bright iridescent lights, portray a beautiful architectural form. The too white cup and saucer are also used to bring increased attention to the lonely woman. Edward Hopper uses his signature style to convey the many contradictions occurring during the 1920s. The portrayal of a lone woman, bold colors and geometric structure create a deep visual image. The Automat was Hopper’s way to show his view of the times in which he was living.